If you have any questions or suggestions you are welcome to join our forum discussion about Combining Relative Strength Index, Bollinger Bands and EMAs . The current article will present to you a trading strategy which combines EMAs, Bollinger Bands and Relative Strength Index. It uses a 5-period EMA, a 75-period EMA, 20-period Bollinger Bands and a 14-period Relative Strength Index. The entry rules are as follows. Enter long when a bar closes above the 75-period EMA and above the Bollinger Bands’ middle line, while the RSI has a value exceeding the level of 50. Conversely, you should enter short when a bar closes below the 75 EMA and the BB’s middle line, while the Relative Strength Index is at or breaks below the level of 50. Your stop loss can either be at a fixed level, or you can trail it. There are three support/resistance levels according to which you can place it – the 75-period EMA, the signal bar’s low or the most recent swing low of the 5-period EMA. You can use the line which is in the middle of the three as a stop-loss level and you might want to add an additional distance of several pips so that random noise doesn’t trigger it. Having determined your stop-loss level, thus risk exposure, you can proceed with estimating your profit target. In general, traders should aim for a 1:2 risk-to-reward ratio but there are many variations. You can begin scaling out after achieving 1:1 ratio and trail your stop for the remainder of your position, or you can aim for double the amount risked (1:2) with your entire position. Your profit target should generally depend on the amount risked – if your stop-loss is too wide, 1:2 ratio could be too hard to achieve in some cases and thus be too risky (inadvisable for novice traders). Also, stop-loss placement and profit targets should be determined in accordance to each trader’s preferred money management system. Most Forex tutors will recommend newbies not to risk more than 2% of their trading capital in a single trade. To learn more on money management and trading psychology, visit our Forex Trading Academy’s “Money Management” and “Trading Psychology” sections. So here is an example of this trading strategy. As shown in the example above, we enter at 1.0905 beneath the close of bar (1), which crossed below the 75-period EMA (blue line) and the Bollinger Bands’ middle line (red line). 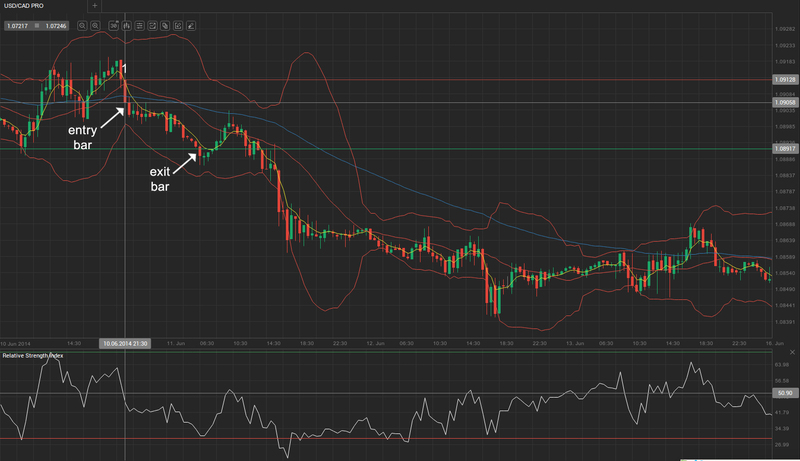 As you can see, RSI has also just crossed below the level of 50. When considering our stop-loss, we see that the most recent 5-period EMA (yellow line) swing high, the high of the signal bar (1) and the 75-period EMA are close to each other, with the signal candle’s high being in the middle of the other two. Our stop-loss is therefore at 1.0912 and is visualized by the red vertical line. Because our capital exposure is considerably small, we will aim for a 1:2 risk-reward ratio, or 14 pips. Our profit target (1.0891) is visualized by the green line. Upon reaching it, a trader might choose to scale out and take partial profit, while keeping a portion of his trade into the market to capitalize on a possible trend continuation, or he can exit the entire trade.